Cute Outfits with Adidas Shoes for Girls. Adidas, which happens to be one of the best and overtly overrated sports fashion brand in the world, not only rules the preferences of guys but of girls as well, and is becoming increasingly preferred by commoners as well as celebrities who just cannot miss out on including at least one Adidas accessory in their outfit. Adidas is the largest sportswear manufacturer in Europe and now you are going to love it even more with what we are about to offer. 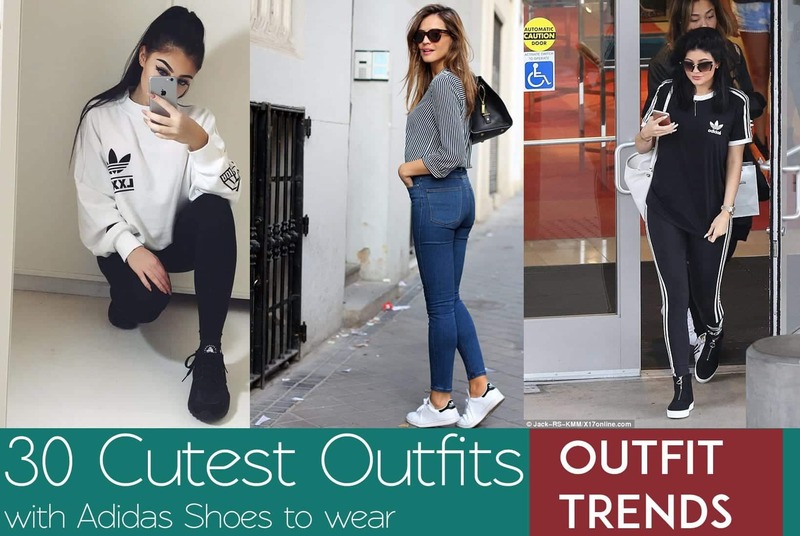 Have a look at these 30 awesome outfits with Adidas shoes including the remarkable superstar shoes, regular sneakers, trainers, joggers, etc, and make your style attractively sportive! A casual street style or a summer style with a cool striped top and jeans and a nice pair of Adidas sneakers to add a bit more swag. We all know how leather jackets make amazing addition to any possible outfit and we are here to make it even truer by giving you an idea of how it will fo with best possible Adidas sneakers. If your workplace isn’t too formal you can easily get off by wearing you adidas shoes with jeans and a tank top, layered with a blazer for the professional touch. A celebrity style and none so ordinary as that of the gorgeously sportive Kylie will also come in handy for you to decide your sporty wardrobe this year. So do not miss out 80 Stylish and Hot Pictures of Kendall Jenner In Shorts. Adidas shoes are surely the most versatile shoes to have in your closet since you can easily wear them anywhere and anytime you want. If you’re a young college or school going girl then you definitely need to try wearing skinny cuffed jeans and a flowy blouse with these shoes for an effortlessly cute look. Denim jacket is also one of the best things for a complete outfit, and a cute pair of Adidas shoes will do the rest. Ripped tights are one another new fashion element taking wardrobes by storm and wearing ripped tights with an Adidas sneaker is just way off the edge. If you’re getting late for school and can’t decide what to wear then this can definitely be your go-to look. A crop top and Adidas shoes go really well together for a chic but simple look. Ever imagined wearing Adidas shoes with a dress? Have a look at how hot a sweater dress looks with Adidas shoes. The perfect look for party time in Winters. You could also add leggings if you want something more warmer and comfortable. Kylie Jenner seems to be a huge fan of Adidas shoes and is often seen wearing them for a casual day out. In fact, it wouldn’t be wrong to say that Kylie is obsessed with Adidas shoes. She usually wears them with tracksuits for the perfectly chic sporty look. So this is one Kylie outfit that you can easily copy. We would like to end with a short note on the best hairstyle to go with Adidas shoes. As you might have noticed in the pictures above, most of the models, bloggers, and even celebrities chose to go for a messy hairdo with these shoes. This is because firstly, messy hair are simply back in style. And secondly, because adidas sneakers give you an excuse to dress down and feel relaxed so you don’t really need to put much effort into your hair. You can just be yourself in these shoes and rock your natural beauty! Casual sports dressing always my favorite. Thanks for the inspiration.